After a delay of over six years, Goa has a 400-page blueprint for development. But the Goa Final Regional Plan 2011 has environmental groups, urban planners and the public up in arms. They want it to be repealed since it has subverted a draft plan released earlier for public comments. "Sweeping changes have been made in the final plan, mostly related to land use. Prime forestland, mangroves and coastal regulation zones have been opened for urbanisation," says Dean D'Cruz, secretary of the Indian Institute of Architects (Goa chapter), Panaji (see box: Not in the draft). The Goa Heritage Action Group (ghag) claims that the plan's implementation will damage Goa's ecology irreparably. "The final regional plan, to be executed within a time-frame of 2001 to 2011, is already late by six years. We had expected the planning department to research land use in Goa, its ecology, and the effect of urbanisation before bringing out the plan. But the final output belies our hopes. Copies of the plan are still not available to the public. Only some key maps from the document are displayed in the department's office at Panaji," says Heta Pandit of ghag. Planning Until the October notification, the planning department followed the Regional Plan 2001, notified in 1988. 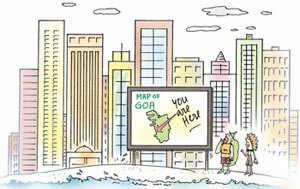 A revised final regional plan should have been notified by December 2000, but only the Draft Goa Regional Plan 2011 was released for public comments in January 2000. Based on suggestions, a revised draft plan 2011 was published on November 28, 2003, which was also put in open for public comments Yet again, another notice was issued on November 18, 2005 and the deadline for final comments was December 15. A lot of the comments came from builders demanding relaxation in zoning, claims a planner. Incidentally, Atansio Monserrate, Goa's minister for town and country planning, is himself in the construction business. Under the Goa Town and Country Planning Act, 1974, haphazard revisions of the regional plan were not allowed for a period of five years from its notification. But in 1988, this act was amended permitting revision of the regional plan "as and when required". Using this amendment, over 1,000 revisions were made to the Goa Regional Plan 2001. For instance, a single revision dated July 13, 2004 (Series III, No 15) converted 18,697 sq m of orchard land into urban settlements, 1,050 sq m from orchard to industrial land and 2,291 sq m from cultivated land to settlement land. Another such move was made on October 3, 2005, when the state government promulgated the Goa Town and Country Planning (Amendment) Ordinance, 2005. The aim was to amend section 17 and section 29 of the 1974 act and give absolute powers to the state government to alter any part of the regional plan and the outline development plan from "time to time" upon receiving applications from private landholders. It also reduced the time available for comments from the initial 60 days to not less than 15 days. Further, panchayat permission was not considered mandatory for changing plans in rural areas. But the ordinance could not be notified due to public pressure . With the recent notification, while the state government seems to be having the last laugh, activists are resolved on fighting it out. Citizens, activists, planners and environmentalists have organised public protests and signature campaigns, but nothing will stop the state government from going ahead with this 'illegal' plan, feels D'Cruz. The recourse for the people for now, it seems, is to approach the Bombay High Court.